4 / Thu " セッションナイト!! (Open Mic Night)"
5 / Fri " セッションナイト!! (Open Mic Night)"
6 / Sat " 桜ん前線"
11 / Thu " セッションナイト!! 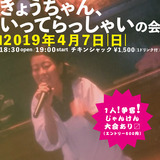 (Open Mic Night)"
18 / Thu " セッションナイト!! (Open Mic Night)"
26 / Fri " セッションナイト!! (Open Mic Night)"
' Chicken Shack 44years Anniversary Party!! 1 / Wed NOZOMU's Birthday Party! !